The USS Gerald R. Ford. The newest and costliest U.S. aircraft carrier, praised by President Donald Trump and delivered to the Navy on May 31 with fanfare, has been dogged by trouble with fundamentals: launching jets from its deck and catching them when they land. Now, it turns out that the system used to capture jets landing on the USS Gerald R. Ford ballooned in cost, tripling to $961 million from $301 million, according to Navy documents obtained by Bloomberg News. While the Navy says the landing system has been fixed, the next-generation carrier built by Huntington Ingalls Industries Inc. still hasn’t been cleared to launch F/A-18 jets carrying a full complement of fuel tanks under their wings, a handicap that could limit their effectiveness in combat. The twin issues underscore the technical and cost challenges for the planned three-ship, $42 billion Ford class of carriers that is drawing increased congressional scrutiny. The Navy and Trump want to increase the carrier fleet from 11 authorized by law to 12. Senate Armed Services Committee Chairman John McCain has long criticized the Navy’s management of the Ford program and joined a congressional effort that capped funding for the first carrier at $12.9 billion and for a second ship under construction, the John F. Kennedy, at $11.4 billion. He grilled Navy officials on the carrier’s costs at a hearing of the committee on Thursday. While it’s encouraging to see the Ford “finally delivered to the Navy,” the Arizona Republican said, the service’s funding request for it exceeds the congressional budget cap by $20 million. Now, McCain said, the Navy wants to award a construction contract for the third ship that’s $1.6 billion more than the previous one. “This is unacceptable for a ship certified to be a repeat design that will deliver just three years later,” he said. The surge in costs for the development phase of the advanced arresting gear — built by General Atomics to catch planes landing — was borne by the Navy under terms of that contract. In addition, the program acquisition costs of the three systems built so far more than doubled to $532 million each from $226 million, an increase which must be paid by closely held General Atomics. General Atomics spokeswoman Meghan Ehlke referred all questions to the Navy “per our contract.” Captain Thurraya Kent, a Navy spokeswoman, said the contractor forfeited all bonus fees it could have made during the 2009-2016 development phase and the service is reviewing the company’s master schedule for the John F. Kennedy weekly. The Navy also has placed personnel at the company’s facility in Rancho Bernardo, California, to monitor progress. Most of the cost increase was driven by an underfunded technology phase that didn’t allow enough time for the discovery and correction of problems and for the technology to mature before the start of the development phase, Kent said. It’s “a lesson the Navy will ensure is applied to all future programs,” Kent said. The Navy reported the cost increase to Congress last month because it breached thresholds established under a 1982 law for major weapons systems. It’s separate from the 22 percent increase since 2010 for construction of the carrier, which resulted in Congress imposing the $12.9 billion cost cap. Trump said “when we build the new aircraft carriers, they’re going to be built under budget and ahead of schedule, just remember that.” Still, the Government Accountability Office said in a new report Tuesday that the John F. Kennedy’s cost estimate “is not reliable and does not address lessons learned” from the Ford’s performance. Until the catapult problem, which was discovered in 2014, is resolved it limits how much combat fuel can be carried in planes being launched from the carrier’s deck. That “would preclude normal employment” of the F/A-18E/F Super Hornet and the radar-jamming Growler version because “the aircraft are limited in the types of missions that they can accomplish” without added under-wing fuel tanks, Army Lieutenant Colonel Roger Cabiness, spokesman for the Pentagon’s testing office, said in an email. He said the Navy asserts that testing on the ground has solved a software flaw that caused excessive vibrations of those fuel tanks. Acting Navy Secretary Sean Stackley told the Senate committee Thursday that fixing the vibrations was simply part of a “systems tuning effort” for each plane that will launch from the carrier. 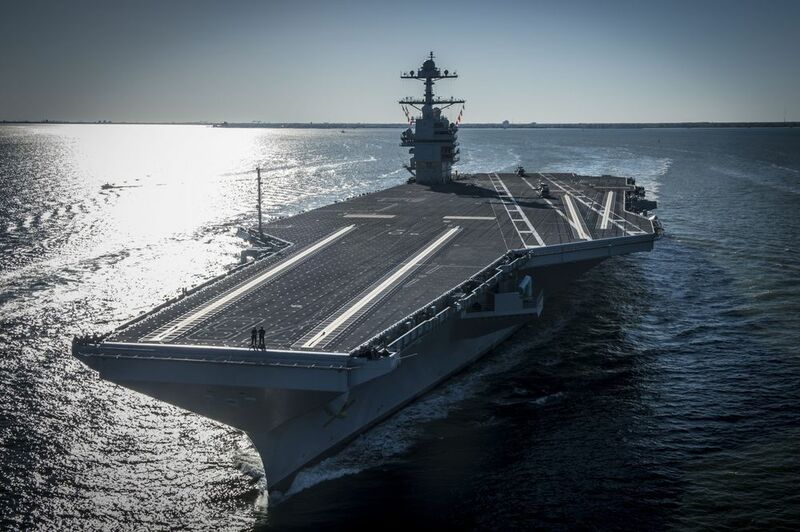 “The Navy estimates the software problem will be resolved and software updates incorporated” on the carrier for testing at sea during the vessel’s post-shakedown phase between May and November of 2018, Michael Land, spokesman for the Naval Air Systems Command, said in an email. He said actual launches of jets with wing tanks will follow in 2019. The Navy still has time to fix the catapult issue. Though the Ford has been delivered, the ship is not scheduled to be declared ready for operations until 2020, with first actual deployment planned for about 2022, according to spokeswoman Kent.